Shop Roland BA330 Battery Powered Portable Stereo PA System from AMS with 0% Interest Payment Plans and Free Shipping. 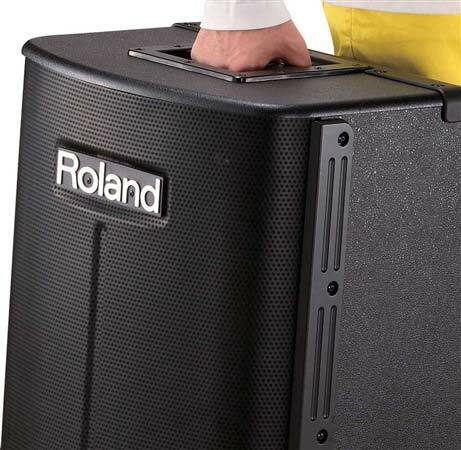 The Roland BA330 portable PA system delivers high performance sound that defies it sound whether it is plugged in or battery powered. 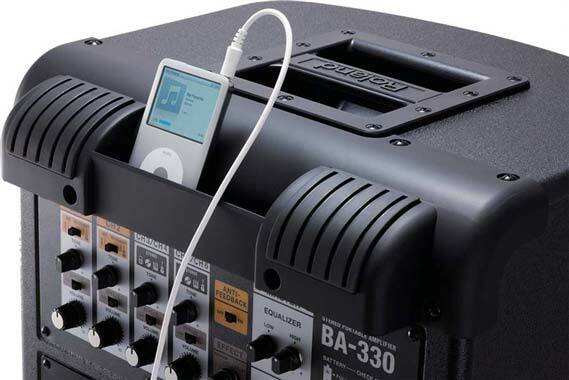 The portable BA330 PA system features a digital stereo amplifier which drives four 6.5 inch stereo speakers and two tweeters, positioned for wide stereo projection. It's the ideal, all-in-one portable PA solution for small music venues, worship events, conferences, seminars, business meetings and much more. 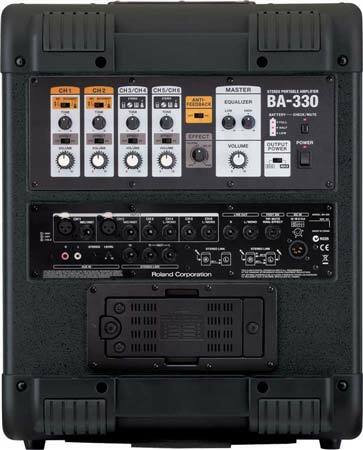 If you've ever encountered embarrassing feedback onstage, and most of us have, you'll be pleased to know that the BA330 is equipped with Roland's advanced Anti-Feedback technology. 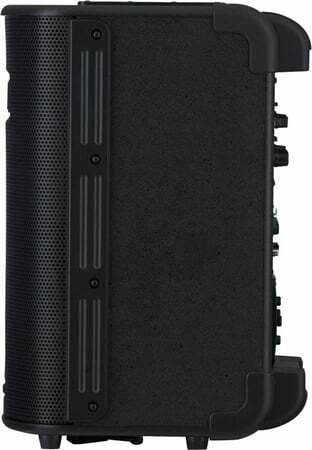 With a simple switch, the BA330 automatically detects the howling point and eliminates feedback. Three high-quality effects are built-into the BA330: Reverb, Delay, and Wide. The effects can be turned on/off independently for each channel. In addition, a master 2-band EQ is provided as well as EQ control for each channel. A wide range of instruments, microphones, and devices can be plugged into the BA-330 simultaneously. Two mono channels are provided for microphones or line-level instruments (XLR and 1/4 inch jacks), two stereo channels are provided for stereo instruments (1/4 inch L/R jacks), and a stereo Aux input channel is provided for CD players and other devices (RCA and TRS jacks). The BA330’s Stereo Link jack lets you cascade two units, giving you twice as many channels and the ability to position the two units on opposing sides of the stage. Weight: 13.8 kg30 lbs. 7 oz. I replaced two Roland Street Cubes with this one unit and boy am I ever glad I did. Very portable and being powered by eight double A batteries, I'm totally independent of electrical service needs. Between this BA330 used with a battery powered harmonizer and wireless guitar/headset mic, man, I've got people staring with their mouths dropped open. My volume can reach for blocks with plenty of headroom left. I can be "neighborhood wide" and my gear sounds clear and strong and even makes ME sound nice with an amazing amount of ease.. Thanks AMS!!! American Musical Supply has made it possible for me to own the finest gear I've ever had. From my Martin D-41 right down to a complete electrically independent sound system, man, they have treated me like Clapton and all with totally interest free financing. I absolutely can't wait for Spring and warm weather to get my self outside and perform. These guys at AMS are great; give them a chance- you won't be disappointed. Great and loud! Perfect for gigs and practicing! the only reason I didn't give it 5 stars was because they didn't use the combination XLR to quarter-inch inputs like on the Roland Cube XL. So good I bought a second one right away ! 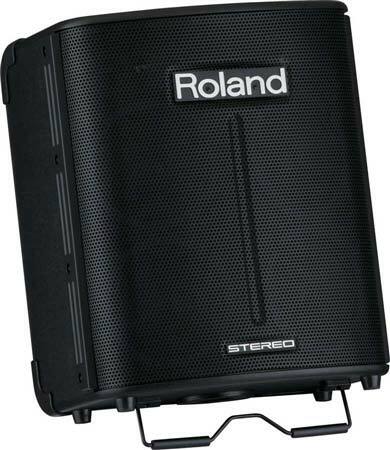 Bottom Line, Rugged Roland Build, Not a unit you would hesitate to rely on.I have been on music in 1974.First a musician and now a Dj.Cant beat the build or the quality.I just sold my Bose L1 Compacts and replace them with 2 of these and Im glad I did.The L1 compacts for someone who gigs a lot can be a bit fragile and also I find the feedback suppression to be much better with the Rolands. Also the Bose Systems have no effects.For my purpose these are awesome for Wedding Ceremonies, beach weddings,Karaoke, at weddings if there are family musicians they can plug right in.Very flexible and very well built! Roland got this baby right. Looks like very well made..
Roland has really out-done them selves. 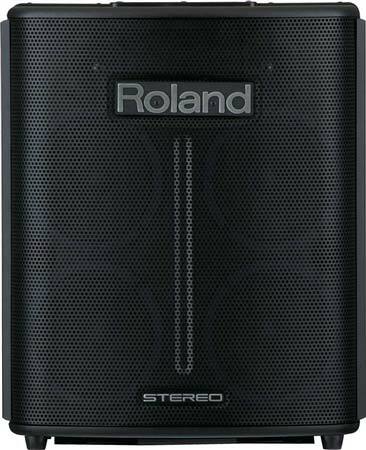 I've been using roland products for fifteen years or so and have been using a street cube as soon as they came out and it still working great but it can't compare in sound quality to this little PA with the BIG sound. I can not beleive the sound quality of this small PA And it can run several hours on 8 AA battery's, the cheepest battery's out there.Comparing it to the Fishman SA220 Solo performance PA that coast $999.95 I think it sounds just as good with 4 channels+aux ch and man this amp gets loud but sounds great, low end high end,its all there.All I can say is "unbelievable"
The Little PA that Could! Roland generally builds rugged, well-designed products. This seems consistent with that standard. Best features are: compact size and weight, amazing volume, rich sound, very wide dispersion, decent feature set, great price for what you get. The only change I'd make would be to make the mixer section detachable, so that you could access the mixer controls when the unit is on the floor in tilt-back position. Warm and punchy. Not brittle like the Bose units I've heard - particularly the L1 Compact. The sound reproduction is amazing. It took all of 5 minutes to read and figure out how to use this PA. Very user-friendly. Amazingly clear and authentic. The guitar sounded especially true. Vocals were delightful. Very solid construction, typical roland amp, very well made, if not better than previous models. Sound quality, loudness and runtime for the amount of batteries needed. If you do the math, it is running at a mere 6 watts. I cannot believe the sound this gets. I've seen keyboard amps that are not as loud. Is it witchcraft? magic? Couldn't be easier, plug your instrument, turn it on.